It’s been a long time since you’ve felt so much like the enemy. Since I’ve wanted to keep you at arms’ length and push you away. When I asked you a question at the start of our last session and felt brushed off by your reply, I was surprised at how much it hurt. Surprised because I’d been feeling so cut-off I wasn’t sure if you still had the power to wound me like that. Before the Christmas break I would have just let go and cried, but instead I tried to contain it and keep it inside. I was guarded and I was holding back. I’ve been turning away from you in session, I know I have, but I don’t know if you’ve noticed. It’s very subtle – just shifting in my chair so that I can turn a little to the side. It’s not deliberate, but I’m aware of it happening. Before the Christmas break I was pulling my chair closer because it felt as though the distance between us was too great; but recently I’ve been pushing myself back into my chair in an attempt to get further away. Sometimes I want to leave mid-session – it feels pointless to keep talking when I’m not connecting emotionally with anything I’m saying. It feels too difficult to carry on when you feel like an outsider and I feel so alone. I feel disconnected – from you, and from my own feelings about you. I can’t reach you – you feel completely inaccessible. I feel as though I’m relating to you from behind a glass wall and I have no idea how to break through. What are you thinking and feeling? Are you feeling anything at all? Does anything I say have an emotional impact on you? And what do I have to do to get some sort of reaction from you that makes you seem real, human and invested in me, and not just like a well-meaning bystander? When there’s a chink in the armour of my disconnection, I bounce between longing – and anger and resentment. When I opened up to you about the more troubling aspects of my feelings for you, on some level I felt as though I was trying to forge a connection by bringing something to the table that you would find psychotherapeutically interesting – something to analyse and theorise over. It was almost as if I was giving you a special gift, not just of my trust, but one that represented professional excitement for you, and emotional intensity for me. But the reality was very different – it seemed to be just an ‘ordinary’ gift to you, and I felt little apart from confusion. As for you – I had no idea how you felt. It was afterwards that the anger and resentment kicked in. You’re so keen to try and show me other viewpoints, other ways of seeing things. So keen to open me up to the possibility that there are explanations for things that don’t involve me blaming myself all the time. So maybe it’s you who cannot reach me; you who’s not trying hard enough and who’s failing to tune into me, and not the other way around. Do I really believe that? I don’t know. I want to hurt you and to protect you from hurt, all at the same time. I feel so terribly unfair. You don’t deserve these words and on some level I know that they’re not true. But I’m so desperate and frustrated. Where is the person that I love? Where is that love, and why can’t I feel it as immediately as I did? Why do I hesitate to trust you? I spend so much time not looking at you in session. And when I do look, I try and remind myself that what I’m seeing is thoughtfulness, rather than judgement; seriousness rather than dislike; amusement rather than dismissiveness. Sometimes I’m too afraid to look, in case it hurts. But sometimes I want to look and look at your face just to try and find something that I recognize. Maybe I want to see the smile that I love, and feel that it’s for me. Maybe I want to see empathy, understanding, or compassion. Maybe I want to see something of what I’m feeling, mirrored in you. Or maybe I just think that looking hard enough will be sufficient to build a connection again. But I could never keep your gaze for very long; and in any case I’m too worried that I could never keep your attention. Therapy has such a limited repertoire of senses – and when I cannot look at you in session, the only thing that I have left is sound. Sometimes your voice changes – it’s one of the reasons that I’m here. I don’t know why, or what it means, but it’s beautiful and it makes me feel held and cared for. You used that voice in our very first session when I was drowning and in floods of tears, grieving over the imminent loss of Jane. You used it a few months ago when I was distraught because I thought that I was a ‘bad patient’ and was ‘failing at therapy’. It’s a warmer, softer, gentler voice, and I wish that I could remember it clearly, or bottle it and let it out when I need it most. I so wanted some of that gentleness when we were talking about how overwhelmed I was feeling at work. I knew I couldn’t be physically held, but I wanted to be held by that voice. I wanted to feel it wash over me; for it to be my comfort. I needed you to reach me with that gentleness and to connect us with that warmth. But we don’t feel bound together anymore. There is no ‘we’. There is me trying to steer a course in a stormy sea, and there’s you trying to give directions from the shore. But all I wanted was for you to speak the voice that stills the storm. I want to fix this. I want to fix us, but I don’t know how. You said I was resourceful – because I had tried to connect us by talking about things that I thought you would find interesting; by asking you questions to try and find areas of similarity between us and to draw us closer together. But this is my last resource; I don’t know what else to do. I wrote a letter to Jane once, about half-way through our sessions together, and it was the key that unlocked the most intense aspects of my feelings for her. Perhaps I’m hoping that it will do the same for us; or at least, that it will break down the defences that I feel I have been putting up so that I can release what I’m thinking and feeling to you, instead of holding it back. But I’m not sure that my last resource will work. Words are powerful, but on this occasion it feels as though they are failing me. They haven’t unravelled the knots that are keeping me trapped within myself. I’m throwing them out as a lifeline, but they’re falling short. They haven’t anchored me to you – like my spoken words, they still leave me feeling floating and alone. It’s been a long time since you’ve felt so much like the enemy, but maybe I just have to trust that that will change. Unless we sit in silence when we meet, I have no choice but to keep on talking. I can keep on focusing on the ‘less difficult’ areas; I can keep trying to talk about you, and not me. But eventually I’m going to have to take a risk and talk about something harder, even if it feels like nothing. Eventually, I hope the nothing will start to feel like something and you won’t feel so distant anymore. In the meantime, please don’t get frustrated with me, and please don’t close yourself off. I’m trying to feel comfortable enough to feel – but I need to see you being you, to sense you’re really here. To quote a favourite TV episode of mine: “People who are broken don’t want you to be professional, they want you to be real”…. Categories: Therapy | Tags: borderline personality disorder, BPD, feeling disconnected, feeling disconnected from therapist, feelings for therapist, obsession with therapist, therapeutic relationship, therapy, therapy break | Permalink. I am going to start by owning up to the fact that this post has nothing to do either with the film ‘Frozen’ or with gardening. So for those hoping for some insight on either topic – I am sorry to disappoint. Having said that, if you have any interest in the subject of therapy, or if you are in therapy yourself, I do hope that you read on. A couple of months ago I had one of those ‘revelatory’ moments through therapy, that it is easy to live for, but hard to come by. It was a significant realisation for me, as it challenged my assumptions about the nature of therapy itself. Those assumptions had affected both my engagement with the process, and also my relationship with my therapist. The ‘revelation’ had an enormous impact on the way in which I approach therapy, on how I relate to my therapist, and on the expectations I have of what ‘should’ happen in session. (“There is no ‘should’, there are no rules”, I can hear my therapist saying….). In ‘A matter of choice – BPD and self-worth’, I started by saying that therapy has twin tasks – to reveal the ways in which we really think about ourselves; and to ‘make up for’ what has been missing, and that those tasks can be more broadly described as dealing with content (or process) and with relationship. In that post, I said that both of those tasks were important – but that wasn’t the position I started with, several months ago. So much of what BPD is about is concerned with relationships, and my absolute desire for connection had led me to place the therapeutic relationship at the centre of my therapy. It was my primary interest, and I thought it should be my therapist’s primary interest too. All the reading I had done had pointed to the fact (or so I thought) that the key vehicle for change, particularly with a ‘condition’ such as BPD, was the transformative power of the therapeutic relationship. I thought about it, and I talked about it, endlessly –it was my key preoccupation. Those with BPD are often said to have an ‘all or nothing’ approach to life – and this was certainly the case with how I thought about therapy. The therapeutic relationship mattered – and in the context of sessions, it mattered to the exclusion of all else. Whenever my therapist suggested that content and process were important too – or that her task was also to uncover my unconscious thoughts about myself – I argued that that was not possible until the ‘re-provision’ of what had been missing in my life, was well under-way. If the ‘patient’ has not already forged a rock-solid relationship of trust with the therapist, and has not yet been ‘re-parented’, how will they be in a position to cope with the potentially devastating realisations surrounding how they think about themselves? Nothing could have shifted me from that position (or so I thought) – and any attempts by my therapist to try and ‘re-focus’ me, I simply construed as rejection. My husband often grumbles that I listen to my friends but not to him. He can make a point over and over again, but it’s not until I hear it from an ‘independent source’ (whatever that may mean!) that I actually take it on board, and trust it. In this case, it was only when I read the point my therapist was trying to make, in two separate books by Irvin Yalom (a well-known American psychotherapist and author), that it truly hit home. It grabbed me, in only the way that something can when it truly makes its home in the innermost parts of your being. It made both intellectual and emotional sense and I felt it as a conviction at the deepest level. As Yalom also states, “In practice, there is a great complexity in the link between the intellectual project and the therapist-patient relationship”. And he does not deny that the key therapeutic force is the relationship itself. So my focus on this aspect was not misplaced – but my focus was certainly too narrow and too exclusive. The therapeutic force – the relationship – needs feeding in order to maintain its momentum, and its food is both process and content. Its food is ‘the hunt’, ‘the intellectual project’. I have a tendency to want to ‘do everything right’ – and therapy is no exception. It would be easy for me, therefore, to substitute an exclusive focus on ‘getting the therapeutic relationship right’, with an exclusive focus on ‘getting the content and process right’ – or to try and do both. But I think that would be to both misunderstand the nature of therapy, and also to misunderstand what Yalom is trying to say. In the same chapter in ‘The Gift of Therapy’, Yalom writes that he discovered that what he and what his clients remembered and valued about sessions, were very different. He tended to value intellectual interpretations, whereas they tended to value small personal acts that were relevant to the therapeutic relationship. The precise intellectual interpretation was not what made the crucial difference. He writes that, instead, “…the search for explanation kept us engaged and our engagement ultimately made the difference”. I take that to mean that it is not necessarily the precise content of sessions that is most important, but the process of talking about the content, and indeed that it what Yalom said when he talked about the ‘treasure hunt’ being more important than the contents of the ‘treasure trove’. And I have seen this borne out in my own therapy. Recently we discussed a difficulty in a friendship, for which I felt a failure and was blaming myself entirely. My therapist kept offering up suggestions for what might have been going on with my friend at the time, and when I thanked my therapist in my next session for the fact that I had since felt much better, she said she had been trying to give me a different perspective. However, what I took away from that session was a sense that she was on my side. Without that sense, I would have been unable to get through my distress and take on that different perspective. The intellectual interpretation and the personal act: two different views on one session, in which our relationship was made stronger through our shared endeavour and exploration. What I learned from my reading, and from experience itself once I applied that reading to my sessions and ‘widened my focus’, is this: therapeutic alliance is central to change, but it doesn’t have to be central to the conversation. I was ‘majoring’ on our therapeutic relationship, but in doing so, I wasn’t giving it room to breath or grow. By constantly putting the spotlight on it, I was freezing it in time. By neglecting the importance of content and process, I was completely missing the fact that the relationship grows, in the background, using the process and the content as its sustenance. I was not feeding our relationship – I was stifling it, and starving it of oxygen. 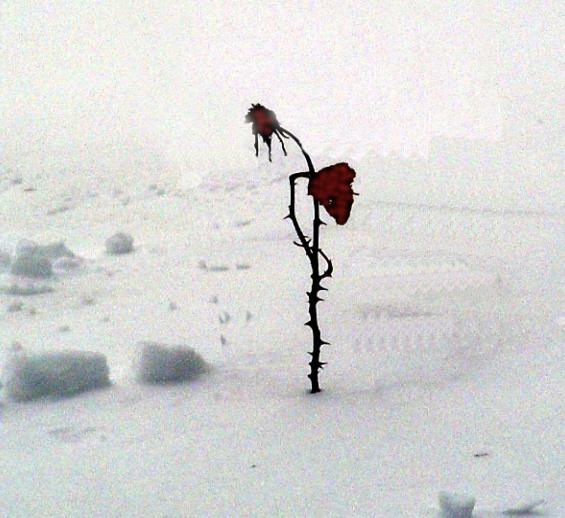 I was expecting a flower to grow, in an expanse of ice. I wanted, desperately, for my therapist to care about me. But what was I giving her to care about? What was I telling her about myself, or my life? We all know that our best and deepest friendships are based on shared experiences, and a shared journey (emotionally, even if those friends are not physically present). My therapist and I need to go on a journey together, and to get to know each other through the things we encounter. If we only encounter each other, in isolation from the world around us, there is not enough ‘grist for the mill’, and there is no way to deepen the relationship. I still have the urge to spend most sessions talking about ‘the relationship’, just as I spend so much time thinking about it. But when I do leave room to talk about other things, it’s amazing how often and how naturally ‘the relationship’ comes into it, whether that’s through the interpretation of a dream, or the way I reacted following a session, or some other situation. But it comes up in a way that is not forced, and which provides continuity and a deeper understanding between us. So for those who are also struggling with what to expect of the therapeutic relationship and who find themselves constantly engaged in thought or in talk about it, my suggestion would be – take your eyes off it for a little while. It will grow – if you let it. But it will do so in the background. It will germinate, it will ripen on the tree, while you are engaged in turning over and ploughing other fields. And when you turn your attention back to it again, you will have a rich harvest of shared experience, understanding and mutual caring. You relationship will have matured, and it will be beautiful to behold. Categories: Therapy | Tags: borderline personality disorder, BPD, feelings for therapist, irvin yalom, mental health, mental illness, obsessing over therapist, psychotherapy, the process of therapy, therapeutic relationship, therapy | Permalink.